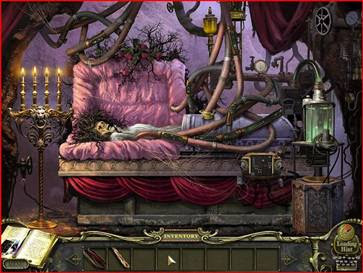 The latest game in the blockbuster "Mystery Case Files" franchise takes hidden-object gaming to new heights ... and new frights. There are few things more frustrating than losing your keys within the confines of your own home. They’re not on the table where you thought you left them. They’re not under the sofa cushions where you’ve found them so many times before. And they‘re not on the key ring because, of course, you never actually use that thing for what it was intended. Surely, you tell yourself, they must be here … somewhere … and yet no amount of searching, sulking, or hissy-fit throwing will make them reveal themselves. But here’s the question I’m forced to ask: Why is it that I get so blindingly frustrated when I’m obligated to hunt for some simple object misplaced within the cluttered reaches of my home … and yet I’m downright thrilled to spend endless mesmerized hours doing the same thing when it’s presented to me in video game form? That is, over the recent holidaze, I found myself staying up into the wee hours of the morning playing the latest “hidden object” game from Big Fish Games. It’s called “Mystery Case Files: Return to Ravenhearst,” and it’s a game so absorbing that it will leave you staring unblinkingly at your computer screen until your eyeballs shrivel into raisins and begin rattling around in your skull. For those of you who haven’t played a hidden-object game, these games typically present players with a static scene. For example, you might be given a picture of a bedroom. But while this bedroom is populated with the usual items (furniture and whatnot), it’s also festooned with an assortment of objects and knick-knacks. You’re then presented with a list of items that you must find secreted there among the bric-a-brac. A broom, a banana, a rolling pin, a key ring. This may not sound like particularly gripping fare, but trust me, a good hidden-object game is easy enough for anyone to pick up and yet it’s such an enormous brain tease that when you go to quit it, it’s as if you’ve super-glued the thing to your hand. You want to put it down and walk away from it … but you simply can’t. Big Fish hired the Berlin Film Orchestra to perform the game’s epic score and they sprinkled live-action sequences throughout the game to further immerse players in the ghostly and ghastly story of obsession and murder. But more importantly, the game has evolved well beyond the hidden-object genre it pioneered. Taking cues from beloved games of the past, “Return to Ravenhearst” adopts the kind of exploration-focused adventure gameplay that made the likes of “Myst” so devilishly enthralling. Indeed, it’s a spine-chilling pleasure to explore Ravenhearst Manor, a sprawling and eerie place of hidden tunnels and secret chambers that have been decked out in an absolutely splendid variety of puzzles. To conquer the game, players must conquer a madman’s elaborate memory game and decipher his convoluted mathematical contraption. There are codes that must be cracked, mechanisms that must be manipulated and tools that must be unearthed and then used in the appropriate places. Your memory skills and your logic skills will be put to the test. But all of it makes good sense. Think carefully and you will be rewarded. Certainly the seek-and-find play is the best it’s ever been. The scenery is both gorgeous and gruesome as you find yourself combing the perverse nooks and crannies of a subterranean prison. And the objects have been so cunningly hidden you’ll be thrilled to see how the artists concealed them in plain sight (that is, once you’ve finally found them). Ultimately, “Return to Ravenhearst’s” crowning achievement is the way it seamlessly blends puzzles, object hunting, exploration and story together. The result feels like an interactive mystery novel in which you get to be the star sleuth. A mechanized memory game is just one of the clever contraptions you'll have to conquer in "Return to Ravenhearst." Jay Bibby, founder of JayIsGames.com, couldn’t be happier. After wading through too many run-of-the-mill hidden-object games, he’s thrilled to see this evolution. It seems unfortunate that “Return to Ravenhearst” was launched during the holiday season – a time when every gaming company on the planet seems to be flooding the market with titles. Though "Return to Ravenhearst" has popped up on a few best-games-of-the-year lists , I fear it could get lost among the clutter. But then again, perhaps I should trust that, in the best hidden-object tradition, perceptive players will be able to find “Return to Ravenhearst” in the crowded scenery. A good place to start looking: MysteryCaseFiles.com. Now you’ll have to excuse me, I have some keys I still need to find.